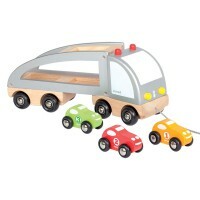 Move your racing team from one track to the next with the Janod Racing Car Transporter. 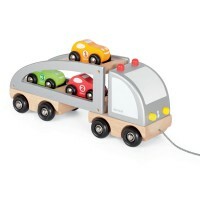 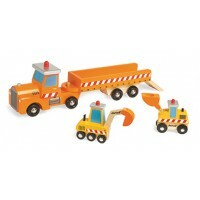 The truck holds 4 wooden racing car vehicles all of which are different styles and colours and are included in the set. 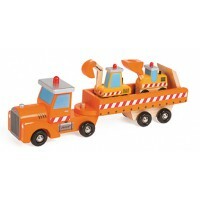 Load and unload them with the movable ramp and unhitch the trailer to use the truck separately. 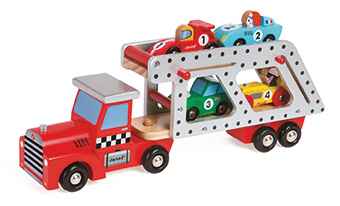 Made from wood with movable wheels, the Racing Car Transporter is a perfect addition to the rest of the Janod wooden racing vehicles that are sold separately.